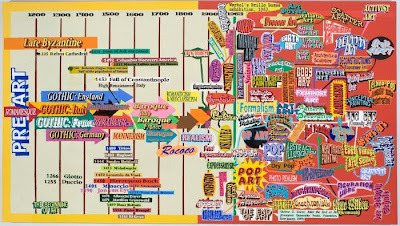 This is the coolest looking art history timeline I have ever seen. We didnt learn about every single movement in the above timeline, some of them ive never even heard of but it shows how they link together. The emergence of Realism, the progressive movement in art and literature. Spurning the ideal, Realists, such as Jean-Francois Millet and Gustave Courbet, sought to depict the truth: in particular, the everyday social truths of the new industrial age. Realism continues to spawn new approaches to the depiction of reality in the 20th century. Era of Impressionism, the name given by French critic Louis Leroy in 1874 to the works of Claude Monet, Pierre-Auguste Renoir, Alfred Sisley, Camille Pissarro and others, after seeing Monet's painting Impression: Sunrise at the first Impressionist show. Impressionists focused on the depiction of outdoor light, although within a decade most of them (including Degas) had turned to painting indoors or in studios. The Pointillist neo-Impressionist artist Georges Seurat creates Sunday Afternoon on the Island of La Grande Jatte, employing the optical colour-theory of Divisionism. The prolific period of the Dutch Expressionist Vincent Van Gogh, which includes his masterpieces: Vase With Twelve Sunflowers (1888), Wheatfield with Crows (1890), Portrait of Dr. Gachet I and II (1890), Starry Night (1889) and others. Era of post impressionism, led by Paul Cezanne, Paul Gauguin, Georges Seurat, Henri de Toulouse-Lautrec and Vincent Van Gogh. Highpoint of Arts and crafts Movement. Emergence of Secession and Art Nouveau, two general art movements which sought to break away from traditions.They also sought to unite the fine arts of painting and sculpture and architecture with the applied arts of design and decoration. The movement was led by Gustav Klimt. A later member was Egon Schiele, known for his disturbing portraits and Art Nouveau cityscapes. Pablo Picasso. Early career: characterized by his Blue Period (c.1901-4), Rose Period (c.1905-7), African Period (c. 1907). During the latter, he created Les Demoiselles d'Avignon, a landmark painting in the development of modern art which signalled a radical departure from the artistic ideas of the preceding ages and heralded the coming of a new artistic movement (Cubism) as well as the birth of modern Abstract art. Picasso combines with Georges Braque to invent the revolutionary art movement called Cubism, overturning conventional ideas of perspective and form)which emerges in 3 stages: Other leading Cubist painters include Juan Gris and Fernand Leger. De Stijl (1917-31), the highly influential Dutch 'school' of geometric abstract art and design led by Theo Van Doesburg and Piet Mondrian, also known as Neo-Plasticism. All these styles were labelled 'degenerate art' (entartete kunst) by the Nazis. In Europe, the era of Surrealiam emerging out of Cubism, Dada, Freud and Communist philosophy, which aimed to fuse the conscious with the unconscious to create a 'super-reality'. Led by Andre Breton, Rene Magritte and Salvador Dali. New York supercedes Paris as the centre of innovation in art, Abstract expressionism emerges as the dominant new style. Leading lights include the so-called action painters led by Jackson Pollock, his wife Lee Krasner and Willem De Kooning, and Colour-Field painters, such as Mark Rothko, Barnett Newman and Clyfford Still. In Europe, this type of Neo-Expressionism focused on the isolation of man. The era of Pop art championed by Andy Warhol, Roy Lichtenstein, Jasper Johns and Robert Rauschenburg. Pop-Artists employ contemporary iconic images in an anti-art approach, giving commonplace articles artistic status. Meanwhile, Op-Art becomes the avant-garde form of abstract art. No 5 (1948) by Jackson Pollock, sells privately for $140 million, making it the most expensive painting ever sold. While prices for contemporary art plummet, Warhol's 1963 silkscreen print Eight Elvises, reportedly sells for $100 million to anonymous buyer.